Balloon animals, Balloon twisters and Balloon twisting in Auckland. Balloon animals and Balloon Twisting is loved by all. 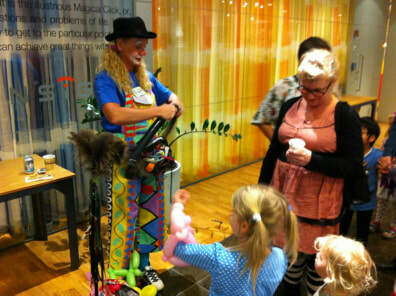 Auckland clown; Cherry the clown will amaze you with his balloon twisting creations; Poodles, flowers and all the favorites. Cherry's Balloon twisting is available for Birthday Parties, Preschools, shopping Malls, Holiday Programs, Corporate Functions, Festivals, Christmas Parties and Libraries. Every body; young and old loves Balloon animals. To see a balloon twister in action always brings delight and amazement. Auckland clowns has many skilled balloon twisters available to provide fun and entertaining balloon twisting to your event here in Auckland. Balloon sculptures for parties and all occasions. Looking for Clowns for birthday parties Auckland, Childrens Birthday party entertainers in Auckland, Birthday party Magician Auckland, Kid's Entertainers Auckland, Birthday party clowns Auckland, Children's Entertainment Auckland,Kid's entertainment Auckland, Auckland Christmas Staff parties, Auckland birthday party magicians, Conference entertainment Auckland, Kids Parties, Kid's birthday party entertainers Auckland, Kid's Entertainers, Auckland clowns for birthday parties, Circus Acts, Circus acts Auckland, Caberet Acts Auckland, Balloon twisters for Hire Auckland, Balloon Twisting Auckland, Birthday Party Pirates Auckland, Clowns for kids parties, Auckland street performers Auckland, Balloon Sculptures Auckland, Balloon animal twisters Auckland, no need to look any further; you are at the right place. Auckland, North Auckland, South Auckland, East Auckland, West Auckland, West Auckland, North Shore, Manukau, Albany, Takapuna, New Market, Henderson, Parnell, Ponsonby, Pukehoe, Papakura, Beachlands, Howick, Rodney, Waitekere, Central Auckland, Franklin...and every where in between.